An individual's learning ecology comprises their processes and contexts, relationships, networks, interactions, tools, technologies, activities and experiences that provides them with opportunities and resources for learning, development and achievement. Embedded within the ecology are the opportunities to be creative in the situated contexts of whatever enterprise is being undertaken. 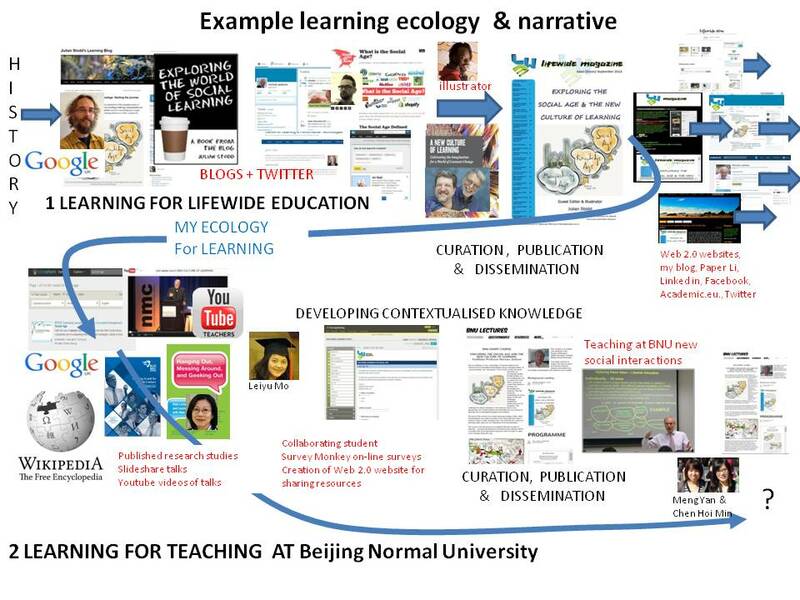 The prompts in the figure can be used as a tool to help you describe and evaluate a learning ecology. We can evaluate the idea of a learning ecology by applying it to our own developmental processes. Here is an example drawn from my own professional life. 1) Over a period of time (eg 4 to 8 weeks) keep a diary/blog of a process you are creating to develop or achieve something in your professional life. Identify the points at which you used your creativity and explain what creativity meant in these contexts and situations. 2) Using the components of a learning ecology 'tool' to guide you, create an annotated diagram to represent your learning ecology and a short narrative of the experience drawing out the ecological features you consider to be important. 3) Provide a short commentary on the value and relevance of the concept to understanding how we learn, develop and achieve new things. 5 I have now begun to codify what I have learnt about the Social Age in a chapter for our on-line e-book.